Last time, we talked about kicking off 2019 with New Year’s employee engagement resolutions. Now that we have the action planning strategy down, it’s time to identify the areas of engagement to target first using 25 employee engagement tips. These are the quick wins that establish the foundation for all future employee engagement improvement. Use this handy #EmployeeEngagement checklist from @HyphenApp to stack, add to and revise your 2019 employee engagement and #PeopleAnalytics action plan! 1. Create a mission and purpose. 2. Set up a continuous communication process. 3. Clarify responsibilities and expectations. 4. Ask the right questions for the analytics you wish to cultivate. 5. Make connections, set yourself up for lasting relationships and develop teams. 6. Foster productive and relevant research. 7. Translate data into actionable, SMART insights. 8. Use SMART insights to set SMART goals (Strategic, Measurable, Attainable, Relevant and Time-Bound). 9. Encourage more employee data-based decision-making. 10. Focus on the cool stuff: innovation and improvement. Engagement has a defined ripple effect. Once your team clearly knows the mission, it’s easier for them to follow the direction of your data-based engagement strategies. Without the clear mission and purpose, 360-degree feedback models lack direction. Vice-versa, without innovative technology to drive SMART insights, data-based strategies lack depth and backing to prove their value. This ripple effect is the central nervous system of your employee engagement as the multiple layers of your strategy collide, connect and build off of each other. This is made possible by the foundation you’ve set for greater engagement and successful teams. Communication is key! Set SMART goals to see the new effects of engagement as it transforms your company. Keep moving towards success by improving with innovation and new ideas. 13. Champion diversity and inclusion. 16. Provide employees with autonomy in their roles. 17. Put growth and development goals in writing. 18. Support continuous growth and education. 20. Invest in development opportunities outside of traditional training. Employees feel valued when their achievements are recognized. When you write goals down, they become tasks, and when they become tasks, they become physical items to accomplish. To drive this narrative further, your employees, much like your engagement strategy, need opportunities to voice their ideas to truly feel included and valued in their work environment. But it’s not just bottom-up feedback that needs to be implemented — it’s a 360-degree conversation system where all voices can be heard and given equal weight. So, taking this a step further, why is 360-degree feedback truly important? Because it re-emphasizes the importance of every employee voice. It is a physical statement to your workforce that their voices matter and have more weight in the organization. It shows them that they are important to the work as more than just vehicles of task completion. Plus, it enables them to have a say in how the various business processes are evaluated and improved. 21. Determine core competencies, values and/or behaviors. 22. Listen with intent of doing. 23. Write feedback down and pair with actionable tasks. 24. Make time for relationship-building activities. 25. Follow-up on benchmarks and goal-setting strategies. 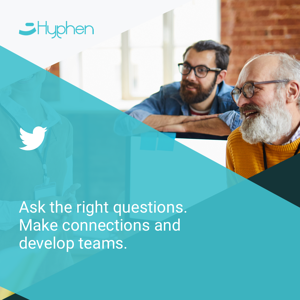 At Hyphen, it’s our strategic plan to revolutionize the way engagement is perceived. It’s not a one-time, annual event or survey — it’s a mobile, on-the-go, continuous process that requires proactive and reactive data-based strategies and SMART insights. Unlock the full potential of your employee engagement and use data-driven tools to find actionable insights your process is missing. Download HR's Ultimate Guide to People Analytics!